Selling art prints in today’s art market is challenging. Nevertheless it is rewarding for visual artists who recognize how to adjust to changing market conditions. (Ed. note. 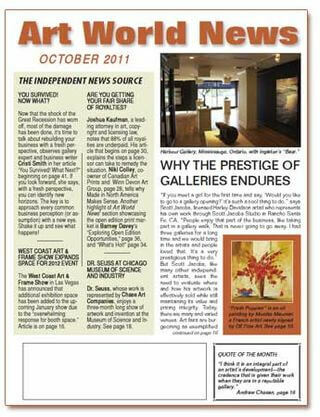 This post is republished with permission from the October issue of Art World News magazine. In the September issue of Art World News, I began this series with a brief review of art print market history recognizing the success of artists and publishers in both open and limited edition prints. This month we will look at how using open editions in today’s market can benefit artists. To be clear, I do not advocate abandoning limited editions for artists and publishers who have success with the model. As the country saying goes, “Dance with the one that brung ya.” Surely, limited editions will remain as a valid marketing model in the print market. The emergence of print-on-demand (POD) technology forever changed the art print market, just as it has the music, film, and book publishing businesses. Other coinciding developments, including affordable small business e-commerce solutions, the influence of social media, the quick acceptance by consumers to buying online, the rise of Big Box retailing, and the flood of imports, combined to drive change to breakneck speeds. Change Is Not Going to Come, It’s Here. Learn to Deal with It! Inevitably, change creates pitfalls and opportunities. How your art business fares depends on your ability to recognize and respond to the changes. Keeping what works, leaving behind what is broken, and leveraging new opportunities are your keys to succeeding in chaotic times. Today, artists have affordable technology to create a delivery system to market to buyers predisposed to buy direct from the artist. Because of uncertainty in traditional markets’ ability to endure, I urge developing these direct marketing channels for independent artists. The tools and knowledge are there for artists who want to manage their careers and dictate how their work gets to market. For many independent artists, selling direct is the future. Nevertheless, some successful galleries and publishers continue to enforce exclusivity on the artists they represent. If artists are comfortable with such conditions, they should try to make the traditional system work for them because there are examples of artists who continue to enjoy success in traditional markets. Still, it’s a smart idea to keep weighing opportunities. The reality is the large number of visual artists versus the declining number of publishers and galleries dictates most artists need to build profitable direct distribution channels to succeed. Fortunately, independent artists have access to affordable, powerful tools and a wealth of knowledge to help them build a successful career. It is reasonable for artists want to earn a decent living from the result of their labor. A way for some is to avoid artificially capping their income by exclusively marketing their digital fine art prints as limited editions. Open editions provide the means to broadening their collector base in the mass market, and the opportunity for beloved images to sell well for decades. Does Your Art Marketing Cater to the New Breed of Art Buyers? It appears a new breed of art buyer is developing. One who prefers choice, convenience and high quality, as opposed to being forced to buy a fine art print with no say in size or substrate. With a growing image library of 3,000 images, the success of the ArtThatFits.com site, which is owned by picture framing giant Larson-Juhl, caters to such buyer tastes. The bottom line is if the art is powerful and reproduced in the highest level then it can be marketed to those who might be called art buyers, as opposed to art collectors. While in both limited and open editions, the primary desire is to own the image, the secondary buying choice for “art buyers” is based on quality, convenience and variety. Until POD evolved, buyers with these needs could not be served and, as such, were never identified or developed. Steve Jobs’ magic at Apple was creating hot products, not by asking what consumers wanted, but rather by developing accessible technology to fill previous unmet needs. Once buyers realized how cool iPods, iPhones and iPads were, they were hooked. I think today’s art print market greatly underutilizes the full marketing capacity of POD in printmaking. Granted, art buyers who want quality and convenience are different from collectors who will only buy limited edition prints. Instead of annoying these collectors with established preferences for limited editions by attempting to convert them, the suggestion is to market to buyers who will pay premium prices for high quality work, but prefer the options offered in open editions prints. Consumers have great access to information, and most have near photo quality digital desktop printers. As such, they know giclées, produced by top digital print ateliers, can be faithfully reproduced as high-end digital prints with no limits. Given the circumstances it seems obvious that consumer behavior is moving towards high quality open editions, especially if they are buying online. Removing the burden of limited edition provenance and the risk of being duped has to simplify the decision and increase sales. “Your writings about limited versus open edition prints were one of the deciding factors in my choice to go to open prints in 2007. It was the right decision for me. The balds are treeless mountain tops and are found at 5800’ along the Appalachian Trail on the Tennessee / North Carolina border. The goats are brought up to the mountain top on the first day of summer and back down the last day of summer. Do You Recognize the Hidden Costs in Publishing Limited Editions? Other things to note about limited editions are the hidden costs involved. The artist or publisher has to establish a system for tracking every limited edition. For a prolific artist, this can become an arduous task. There are laws in 14 states regarding limited editions. New York and California are considered the most stringent. Artists legally need to comply even if they are selling via the Internet from another state. The burden of time-consuming, costly, extra bookkeeping is eliminated with open editions. Arthur Secunda Proved You Can Have It All! The renowned artist, Arthur Secunda, has been shown in leading galleries and museums worldwide. He also had a successful poster printing run with Haddad’s Fine Arts. He was known to express his poster sales helped pay for his studio in France and grow awareness for his work. It didn’t ruin the career of Pablo Picasso when he had a successful open edition print series sold in Sears’s stores in the 1950s. Terry Redlin is one of the most revered Americana genre artists of any generation. He has huge museum that is a major tourist attraction in his home state of South Dakota. During his career, he has sold both open and limited editions of the images. Some of his images were dissected and sold as smaller images. None of this has dissuaded his collector base. Although he officially retired a few years ago, collectors still flock to the museum and continue to buy editions of existing images. Last month, I suggested artists could produce a numbered limited edition of 100 in one size and one substrate hand-embellished by the artist. At the same time, lower grade open edition prints of the same image could be marketed. The key to success here is to be fully transparent by operating one’s business with integrity and honesty. If buyers know the facts, they won’t feel duped about what they are buying. And, those with a collector mentality can still get a precious limited. And, smaller editions are easier to manage on the back end and more likely to succeed on the fickle secondary market. Like the art market in general, the art print business is personal, subject to change and difficult to grasp at times. What works for some artists is suicidal for others. While not every artist has the heartstrings appeal of Terry Redlin’s work, all can take lessons from what worked so well for him. What it comes down to for artists is the need to research, to be introspective, so you know what works best for you. You have to be willing to try new things and equally willing to give up on them if they don’t work out. Ultimately, the decisions about open versus limited editions can only be made by the artist. It is your life. You have to decide what is best for you and your career. When you are comfortable with those decisions, you can plan a course of action to achieve your goals with dignity, integrity and great results.